The typical American garage is getting bigger -- and the vast majority of homes built these days has one. 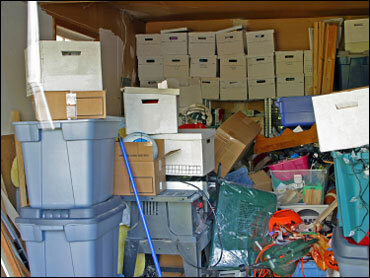 But, more and more, many Americans are using all that garage space to -- store junk! Many people have a house that's neat and organized, but whose garage is a mess. Those folks try to organize it, but ultimately, their garage reverts to chaos. So, with growiong frequency, they're turning to professionals for help. Garage organizing has become big-business. Including home workshops -- comprising everything from auto-repair equipment to upright tool chests -- garage gear has become a billion-dollar industry. The Early Show visited a typical American family whose home is immaculate, but whose garage -- needed help. David and Karen Mandleur (and their three kids!) have a tidy house in East Brunswick, N.J. But their garage was another story. They had sports equipment, a workshop, lawnmowers, and kids' toys and memorabilia, all seemingly rolled into one. They'd tried to straighten it out on their own, but most of the fixes were temporary: Shelves would fall off the wall, bikes didn't have a place, and toys would inevitably end up mixed in with the power tools. So, they called in a company called Garage Tek -- part of a growing niche market that installs custom garage organization and storage systems. Garage Tek created a three-dimensional plan for the garage, came to the house, emptied the garage, and installed custom paneling and shelves -- all in two days. Garage Tek also installed a hopscotch game in the floor for the three kids!. The Early Show was there for day one of the garage makeover, and on Monday, we were there as the Manleurs revealed their new garage -- by opening its door! The typical garage re-do costs $8,000 to $12,000, but Garage Tek's Barbara Butensky had some tips on less expensive ways to get a garage organized, with a place for everything and everything in its place! She says any commitment to organizing your garage is heading in the right direction. First, get everything out and sort it. Then, perhaps start with some new shelves, hooks, and tubs to get stuff off the floor -- making sure you have a system that's flexible and can grow with you, so you really can keep it organized over time." "Make a commitment to the garage," Butensky says. "Recognize that it's a large room in your home, and that the neighbors see it. You use it as your front door." Why is it important to have organized garage? Butensky says one reason is convenience -- it saves time: You stop spending hours going, "Where is that hammer?" looked at, three walks covered. Price doesn't include flooring. cabinets to shoe racks to a wall-mounted work table. piece of the back of the garage. but directs you to Racorinc.com for those products. COST: Free consultation. $9,200-plus; comprehensive system; three walks covered. Price doesn't include flooring. "big box retailers," not available with online design. workbenches, hooks, bins and shelves. Also appliances and flooring.